To this list one welcomes Alan Rockoff’s Under My Skin, a wise, humble, wryly funny collection of essays and columns mostly written for “Skin and Allergy News” over the past 10 or so years. 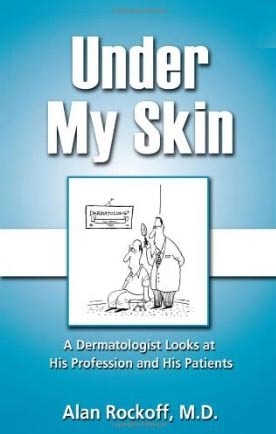 While these were primarily written for dermatologists, they will also interest other physicians, trainees, patients, indeed anyone who wants to be regaled with fine, well-wrought stories. Rockoff’s book addresses the real “clinical” world practitioners and patients live and work in, not the more refined and insulated realm of the Academe. A welcome feature of this book is the short chapters that can be read in a couple of minutes. Each has important take-home messages, some of which are profound. Under My Skin was a pleasure to read. It seemed like a conversation with a sage and seasoned colleague. I particularly liked Chapters 5, “Mistakes,” 23 “Public Health,” and 51 “A Purely Cosmetic Procedure;” however, I suspect that anyone who reads this book will come away with her/his own particular favorites. At present, Under My Skin is not available for the Kindle, but that would be welcome addition. This book was also reviewed for the Indian Journal of Dermatology by Arijit Coondoo: See: IJD Review. This entry was posted in Elpern, David J. and tagged Alan Rockoff, book review, Under My Skin by humanemedicine. Bookmark the permalink.